Chamber Music America is the national service organization for ensemble music professionals. 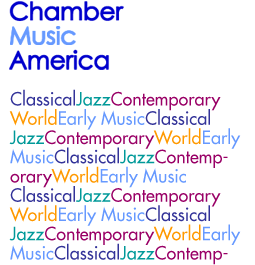 Our members are thousands of individual musicians, ensembles, presenters, artist managers, composers, educators and others in the national chamber music community. CMA serves the national ensemble music community by providing access to an array of professional resources and benefits, professional development seminars, grants and awards, and—through its National Conference and interactive website—opportunities to connect with musicians, presenters, managers and other chamber music professionals across the country. Light Bending Forward - I. At Chamber Music America we work daily to facilitate the creation, performance and enjoyment of chamber music throughout North America. Much of what we do is made possible through generous contributions from music lovers like you.